A real delight of this world is the way the violin is played by South Indian musicians. 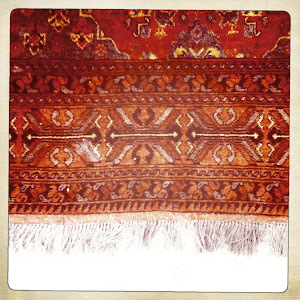 It is as if it is a truly Indian instrument, not imported. Tonight I share a live recording of the fabled Lalgudi Jayaram made in Bombay in the 1970s. Lalgudi Jayarama Iyer (born September 17, 1930, India) is a well-known Carnatic violinist, vocalist and composer. Born in the lineage of a disciple of the saint musician Thyagaraja, Sri Lalgudi Jayaraman inherited the essence of Carnatic music from his versatile father, late V R Gopala Iyer, who trained him meticulously. At the age of 12, he started his musical career as an accompanying violinist. Having an active imagination, quick grasp and an ability to adapt easily to the individual styles of the leading maestros in Carnatic music, while accompanying them in their concerts, he reached the forefront in rapid strides. With the concert experience he thus gained, coupled with sheer hard work and perseverance and the strong urge to give original expression to his musical ideas, he emerged as an accomplished solo violinist. 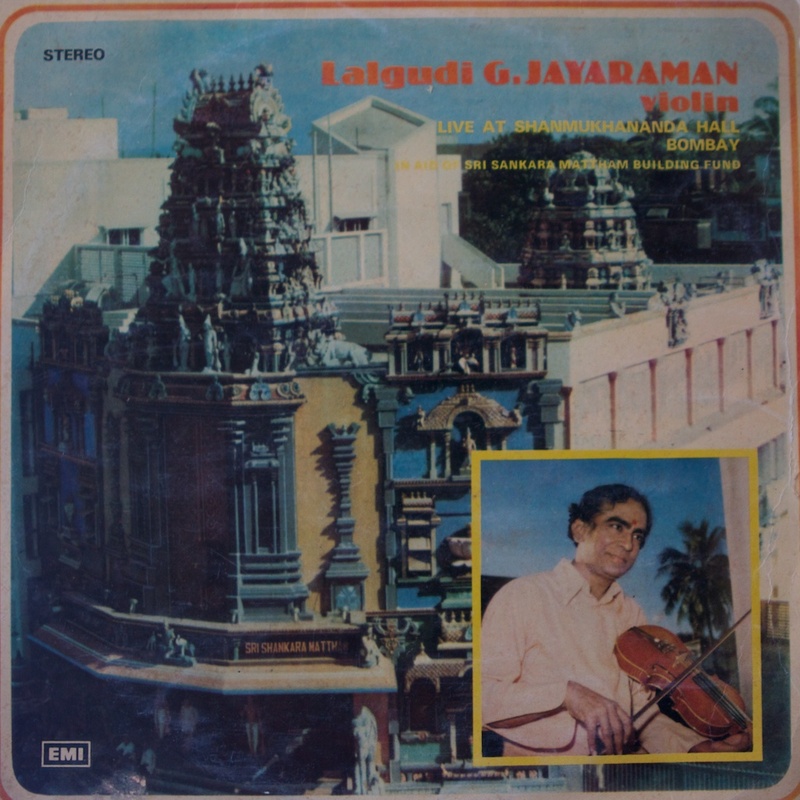 He expanded the style of violin playing by inventing a whole new technique that is designed to best suit the needs of Indian Classical Music and establishing a unique style that came to be known as 'Lalgudi Bani'. His flawless and fascinating style, graceful and original, yet not divorced from traditional roots, gained him numerous fans. This multi-dimensional personality has, to his credit, composed several 'kritis', 'tillanas' and 'varnams' and dance compositions, which are a blend of raga, bhava, rhythm and lyrical beauty. 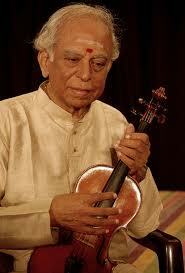 A notable feature about Lalgudi is that his music is very expressive. 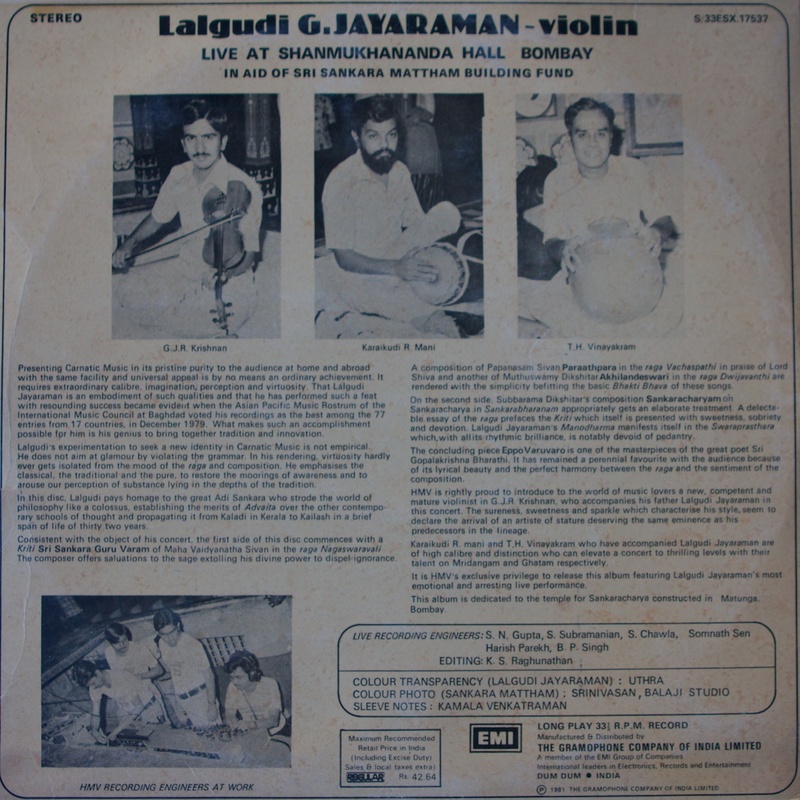 Lalgudi's instrumental talent comes to the fore in the form of lyrical excellence. He brought the most-sought-after vocal style into violin, and his renditions exhibit knowledge of lyrical content of the compositions. He has been in great demand for accompanying vocalists, and has accompanied such great vocal virtuosos as Ariyakudi Ramanuja Iyengar, Chembai Vaidyanatha Bhagavatar, Semmangudi Srinivasa Iyer, G. N. Balasubramaniam, Madurai Mani Iyer, K.V.Narayanaswamy, Maharajapuram Santhanam, D. K. Jayaraman, M.Balamuralikrishna, T. V. Sankaranarayanan, T. N. Seshagopalan and flute maestros like N. Ramani, etc. His accompanying wizardry and quick responses to the various challenges posed by the main artistes remain unsurpassed. His accomplishments are numerous but chief of them is the fact that he was the first to bring international attention to the Carnatic style of violin playing. He also introduced a new concept of musical ensemble with violin, venu (flute) and vina in 1966, and gave several outstanding concerts. He has given concerts extensively in India as well as abroad. The Government of India sent him to Russia as a member of the Indian Cultural Delegation. At the Edinburgh festival in 1965, Yehudi Menuhin, the renowned violinist, impressed by Lalgudi's technique, presented him with his Italian violin. He has also performed in Singapore, Malaysia, Manila and East European countries. His recordings submitted to the International Music Council, Baghdad, Asian Pacific Music Rostrum and Iraq Broadcasting Agency by AIR New Delhi have been adjudged as the best and accorded the first position out of 77 entries received from the various countries during 1979. He was invited to give concerts at Cologne, Belgium and France. The Government of India chose him to represent India at the Festival of India in USA, London and he gave solo and 'Jugalbandi' concerts in London and also in Germany and Italy that received rave reviews. Sri Lalgudi went on a tour in the year 1984 to Oman, UAE, Qatar and Bahrain, which was highly successful. He composed the lyrics and music for the operatic ballet Jaya Jaya Devi, which premiered in 1994 at Cleveland, Ohio (U.S.) and was staged in many other cities in the United States. In October 1999, Lalgudi performed in the UK under the auspices of Shruthi Laya Sangham (Institute of fine arts). The concert was a roaring success. After the concert, a dance drama Pancheswaram, composed by Lalgudi, was staged. Jayaraman earned several titles, such as 'Nada Vidya Tilaka' by Music Lovers’ Association of Lalgudi in 1963, 'Padma Shri' by the Government of India in 1972, 'Nada Vidya Rathnakara' by East West Exchange in New York, 'Vadya Sangeetha Kalaratna' by Bharathi Society, New York; 'Sangeetha Choodamani' by Federation of Music Sabhas, Madras in 1971 and in 1972; State Vidwan of Tamil Nadu by the Government of Tamil Nadu and Sangeetha Natak Academy award in 1979 etc. The First Chowdaiah Memorial National-Level award was given to Sri Jayaraman by the Chief Minister of Karnataka. He also received honorary citizenship of Maryland, U.S. in 1994 and the Padma Bhushan by the Government of India in 2001. He won the National Film Award for Best Music Direction for the film Sringaram in 2006. In 2010, Jayaraman became a fellow of the Sangeet Natak Akademi.